Just in time for winter, red pandas Dr. Erin Curry and Dash have an updated outdoor exhibit to roam around in. New mesh netting surrounds the exhibit, in order to protect the red pandas from outside animals—this dynamic duo can now safely and freely spend time outside. In addition to mesh netting, Dr. Erin Curry and Dash have a new climbing structure, with resting platforms. These red pandas have a multitude of different paths they can discover in the exhibit. 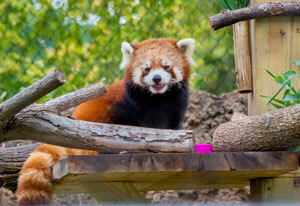 Red pandas love to walk around and be off the ground, making the new climbing structure perfect for the duo. Logs and limbs collected from Zoo grounds were used to construct the climbing structure, giving the habitat a natural feel. Better yet, a reconfigured set-up allows for bamboo—a common enrichment item for red pandas—to be hidden in new spots. Approximately 50 percent of the red panda’s habitat is located in the Eastern Himalayas in temperate forests. Red pandas usually live and stay in the trees, as they are very acrobatic animals. Red pandas are labeled as endangered, with a high risk of extinction in the wild. The decline in numbers is due to deforestation caused by logging and an expansion of agriculture, in addition to poaching. Stop by the Red Panda Exhibit and watch as Dr. Erin Curry and Dash explore their newfound surroundings and enjoy some winter fun at the Milwaukee County Zoo.